Hanna is bookended by the phrase I just missed your heart. Both scenes explore the predatory nature of its lead character, though the scenery shifts from one bound by nature to one bound by human intervention. But the trip from one scene to the other is a mystery as there’s a depth to Hanna (Saoirse Ronan) that is always felt but rarely seen. Hanna is the sort of self-aware film that acknowledges its rather fairy-tale leanings while tinkering with the formula by adding a bit of commentary on globalization and a dash of American villainy. The concept is straightforward: Hanna lives with her father (Eric Bana) in a snowy Finnish cabin as she is trained in combat, survival tactics, and various languages. 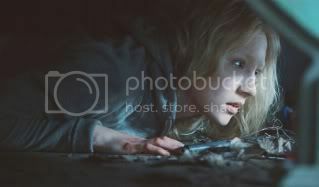 The two end up being the subject of a chase led by CIA Agent Marissa Wiegler (Cate Blanchett), as it becomes more apparent that Hanna is more than a skilled assassin. The film moves at a hyperkinetic pace as the shift from the Finnish cabin to a metropolis to a hippie commune is given little thought. 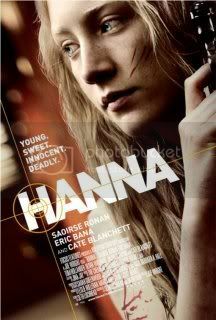 With a soundtrack by The Chemical Brothers, Hanna doesn’t just run, it sprints from scene to scene. If Hanna succeeds, it’s largely based on its sense of efficiency; the whole picture moves with such diligence and force that it’s admirable. Hanna allows Joe Wright to stretch his directorial muscles, constantly moving the camera with such bravado. Some scenes work better than others; Eric Bana’s single-take fight scene in a train station is a bit more fluid than Saoirse Ronan’s grand escape from her prison. But what prevents me from embracing the film is how its incessant pacing makes for a film that feels more mechanical than human. For a film that is bookended by the same phrase, it’s seems like it’s aware that it’s not actually aiming for your heartfelt instincts, but instead assaults you with its visceral imagery, dazzling cinematography, and speed. Saoirse Ronan is an impeccably talented actress though; her piercing glare manages to overcome some of Wright’s more over-directed scenes, wherein she’s capable of actually giving you more of a dimensional character. And the pure physicality of her role is impressive; she makes for a convincing assassin. I enjoyed what Wright attempted to do with the material. And I found the three key actors to do a strong job with their parts. But the two factors didn’t complement each other as well as I hoped.